Read below to see how I have helped others achieve success. I am really happy I invested in working with Tameika. I have struggled over the years keeping consistent with working out. Tameika created a customizable plan for me that helped me get back to working out and reduced the intimidation of weight training. She was easy to chat with and was available throughout the 4 weeks to check in, provide guidance, and just be motivation to keep going. The accountability was really key to stay up with the plan. I am amazed that I lost 7lbs and reduced inches all over from arms to waist. The biggest takeaway is how good I feel. I feel so AMAZING and healthy and that is due to the plan that Tameika designed. It was also very motivational to work with a coach that had been in a similar place before; working toward a healthy lifestyle and that she has maintained it for 11 yrs +. Tameika is so warm and humble and I recommend her coaching to anyone who is looking to get a boost in their fitness/healthy lifestyle. I am a mom of 5 kids and find that often I have good intentions with health goals but then I blink and a month has passed without making any progress. I needed support! I wanted to model my fitness journey after someone who has a healthy lifestyle I felt I could maintain. I love that Tameika chooses to travel, to enjoy life including food! I was so inspired to learn that she intentionally chooses not to be the skinniest possible version of herself, but instead a confident, strong and balanced person living life to the fullest. That's why I wanted to work with Tameika and I'm so glad I did. I have learned how to do the health journey well and in a way that I didn't want to throw out the window after a few weeks. Tameika encouraged me, set a doable plan, and provided the accountability I needed to build new healthy habits. After my time with her, I feel like I know how to eat well again and have put into place so many crucial habits for feeling great. Especially if you are a person like me who has tried a lot of different ways to be healthy, go with Tameika. She is a breath of fresh air in an industry that is too focused on restrictions and not focused enough on truly living well. I got the opportunity meet Tameika at a Whole Experience retreat. Based on that amazing week, I wanted to work with her on a 4-week fitness plan. This was the only time I've "dieted" where I didn't constantly think about food and hate it. I got to eat good food that didn't take forever to prepare. You even get a cheat meal! The workouts were also challenging but not overwhelming. Tameika was also available for my random questions. I ended up losing 8 lbs and quite a few inches. The best thing is that I'm still following the framework that Tameika set up for me because it's SO doable! It's a lifestyle, and not a diet. Highly recommended! Talk about accountability!! But in the best, supportive, and friendliest way. Tameika's service gives you the push to meet your goals and is super personalized and tailored to your reality. What I appreciated was her approach doesn't simply focus on the physical outcome, rather she holds you to your WHY of it all and the feeling you have when you make progress, physically and emotionally. Also, she's realistic so that your weightloss journey is sustainable and enjoyable. I feel like I gained not only an accountability coach but a friend along the way! Tameika is such a wealth of positivity and encouragement that was essential to helping me get back on my health journey and be successful. In addition to creating customized workout and meal plans, she also does a lot of work with shifting your mindset which for anyone that has struggled with weight knows has to be dealt with if you want to be successful. Although we worked together online, she always felt close by. I highly highly recommend her! Tameika is probably the internet's most hidden gem as far as fitness and wellbeing are concerned. She not only leads by example, but fundamentally understands the trick that every fitness guru misses in body-showing posts: and that is, the importance of sustainability in fitness, and that diets and fitness programs only work if they're so tailored to your life that you can keep it up for more than a decade. Others motivate by pushing fo immediate results. Tameika doesn't - she reminds you of the importance of taking longer, reminds you to be kind to your body, goes as far as thanking your body, knows that food addiction is real, encourages to be mindful with your language and reminding us that we're human for falling off the bandwagon and never to apologize - the important thing is to maintain the "upward" pattern of achievement. Guess what - it works, lost 7 inches, and 8 pounds so far and in 8 weeks - working with Tameika is a no brainer - she's the real deal. “All I can say is Tameika is an excellent trainer. She cares about your success and she will be your cheerleader all throughout the process. I was really skeptical at first because many of these "influencers" that you see on Instagram really don't care about emotional or mental state. They just care about selling you a product that may not necessarily suit your needs. Tameika's plan is holistic in nature. She tailors your meals to things you enjoy eating and your workouts even though are challenging, they push you so that you can see those results that you want. Tameika gives you the necessary guidelines that you can use once your 4 weeks are up. Her weekly phone calls keep you accountable and knowing that she is just a text away is reassuring. “I am so grateful to be trained by Tameika. She was absolutely amazing to work with and she truly wants her client to succeeded in their goal. I highly recommend TameikaG! “Tameika has been an amazing trainer and fitness guide. I first found Tameika through Instagram; I was inspired by her fitness journey and her endless positivity! I reached out to her regarding a four-week plan and she responded within 24 hours. I’m generally hesitant to contract with people over the internet, but Tameika completely reassured me. She conducts herself in an extremely professional manner and was able to answer all my questions. I found the 4-week fitness and meal plans to be exactly tailored to my needs. The meal plan recipes were fun and creative, and I never felt like I was on a “diet”. The fitness plan pushed me but was not beyond my physical capacities. It was amazing to see my body change from week to week while following Tameika’s plans. Throughout the 4 weeks, Tameika was always accessible and was very open to communication. She provided me with the support and guidance necessary to follow through. "I had been following Tameika on instagram for about six months looking at her journey and always wanting to reach out. I had previously worked with another influencer but that program did not fit my lifestyle and I didn’t get results and was super discouraged. I finally reached out to Tameika and I’m really glad I did! Not only is she so friendly and makes you feel like she’s on the journey with you and is an old friend she tailors a meal plan with things you enjoy, so you never feel deprived. I never felt shamed for not keeping to my meal plan 100%, instead I felt encouraged to try again and do better and push myself and CHOOSE myself. 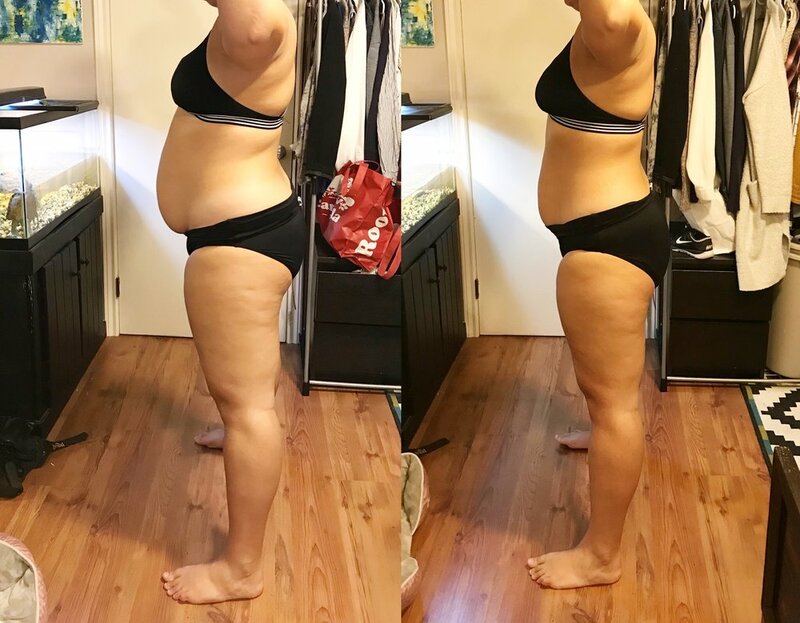 By the end of my four weeks to saw a noticeable difference in my body, my fiancé did too! It was so empowering to finally see things change in my body and to make the healthy choices when it comes to food. It became second nature to have a healthy breakfast lunch and dinner and work out 3-4 times a day. I’m so grateful for Tameika’s patience and most importantly her kindness while we worked together. I understand my body better and I now know that my body is amazing and whatever I put my mind to I can accomplish. I intend on being a returning customer!" " Tameika is such a relatable person, she understood my background, how work and life challenged me and understood what I needed to get back on track. I've tried many diet plans and fads but struggled to find something I could stick to long term. What I have missed in my health journey has been the open and honest conversations about food and my individual body. She made the coaching and accountability process so much easier and freeing. I lost weight and inches all over my body, I haven't had success in my health journey like this in a long time! While the numbers are important, the journey is even more important. I don't have to be afraid of food or what happens after the plan is "done" because my lifestyle is changing. I enjoyed working with Tameika very much and would recommend her to any and everybody!" "I have been following Tameika a few years now on Instagram and her journey has been amazing! Watching her take on new challenges and travelling the globe while keeping up with her fitness goals has been inspiring! When I needed help with my own health and wellness goals, it was a no brainer to sign up with Tameika. Her dedication and passion to her clients definitely kept me motivated to stay on track and focused on my goals. Her plan is easy to follow and it encourages you to make lifestyle changes without feeling restricted and drained by the process. You still have the ability to enjoy the foods you love, while maintaining portion control. Tameika is the trainer you walk away feeling like she is family.She cares about you and genuinely wants you to succeed. She is encouraging, passionate and motivating. She cheers you on when you succeed and reassures you when you feel stuck. She pushes you to want better for yourself as she wants better for you. Her personalized approach makes you feel she is right there with you while being available to you whenever you need that support and push. I have worked with other trainers in the past and clearly I did not succeed because I didn't have the support I needed to push myself but after working with Tameika, I know for a fact that I am on a path to my goal and will stick to this path for lifetime. If you haven't figured it out by now then let me put it plainly. Working with Tameika is a great idea! You will not regret it and you will walk away happy you made that decision. She is awesome and I highly recommend her if you are ready to make a change for the better! "I am a mom of 5 kids and find that often I have good intentions with health goals but then I blink and a month has passed without making any progress. I needed support! I wanted to model my fitness journey after someone who has a healthy lifestyle I felt I could maintain. I love that Tameika chooses to travel, to enjoy life including food! I was so inspired to learn that she intentionally chooses not to be the skinniest possible version of herself, but instead a confident, strong and balanced person living life to the fullest. That's why I wanted to work with Tameika and I'm so glad I did. I have learned how to do the health journey well and in a way that I didn't want to throw out the window after a few weeks. Tameika encouraged me, set a doable plan, and provided the accountability I needed to build new healthy habits. After my time with her, I feel like I know how to eat well again and have put into place so many crucial habits for feeling great. Especially if you are a person like me who has tried a lot of different ways to be healthy, go with Tameika. She is a breath of fresh air in an industry that is too focused on restrictions and not focused enough on truly living well." "Tameika, I enjoyed your program very much. What I liked most was the simplicity of the recipes and they tasted good too. Your coaching was encouraging and honest. I felt like you genuinely cared about my progress and that it was not just about the money. The exercises were right where I am and I actually lost some pounds. The food preparation is also helping our whole family to eat better so thank you very much". "Being one of Tameika’s clients was one of the best decisions I’ve ever made. She is very knowledgeable and always available for any questions. Her meal plan was my favorite as it incorporated real meals, including PASTA!!! Her workouts are challenging but possible to complete. I would gladly recommend her to anyone looking to focus on their health!" "Eating healthy has always been a struggle for me. Low fat, low carb, juice cleanses. I've tried it all. With Tameika's meal plan I was able to structure my meals to ensure I was getting enough nutrients to fuel my day and workouts. The meals were very realistic, easy to prep and something that I could follow longterm. Not only did I lose weight, I also saved a ton of money as I didn't eat out as much. Her weekly check-ins also kept me accountable and ensured that I didn't venture off. Thanks Tameika!" "I started following Tameika on Instagram a few years ago when my best friend tagged me in her post. She talked about her weight loss journey and how she did it on her own. I was a bit skeptical to reach out as I've tried every diet out there. They never worked because the moment I tell myself I'm on a diet, I feel deprived (because no on likes to eat a salad all day everyday) so I eventually fall off the plan. It wasn't until recently when I've exhausted every option out there and decided to reach out to Tameika to help me prepare for my wedding day. Honestly, it was the best health decision I've ever made. I lost 12lbs and 10inches overall in ONE MONTH and I didn't have to starve myself. The meal plan was catered to me and all of my favourite foods. But aside from the meal plan, I appreciate the fact that she constantly checked on me and she is was there for the days that didn't go as planned. She helped me make better health choices so that I can continue on my journey successfully." "Being obese for quite some time now, I have basically tried it all. With not much more to lose, I decided to give Tameika’s plan a try. Doubtful of whether this was going to work for me because everything else has failed, I was completely turned around. Tameika does much more then just diet and workout plans. Her support, council and guidance is valued at so much more then money could ever buy. Tameika has been there, she knew my struggles, she knew where my head was at, she knew how to motivate me and get me back on track when things were tough. I mean, 20lbs in a month? I couldn’t be happier to have such a kick off month and I cannot wait to continue my path that Tameika has put me on. I feel comfortable in a gym, a feeling I never thought was possible for me. I look at fast food and pizza as a choice I no longer want, versus a choice that I cannot have. She has changed my life, she has such a special place in my heart and I am so blessed to have been able to work with her this past month. Tameika, I can never thank you enough, you are absolutely incredible! Here’s to the next month of hard work, I promise to make you proud!" “I started following Tameika on IG, adding her to the list of motivational women who love fitness and showing how to maintain their weight by choosing the lifestyle of health/fitness. My number 1 goal going into any fitness challenge/weight loss program with a trainer is HOW ARE YOU going to help me maintain the weight afterwards, and Tameika’s program does just that. A little background about me, I’m already into fitness and have been active for over 10 years, but my biggest challenge is my relationship with food (I’m a binge eater, on my cheat days) so my weight always yoyos once I get to my goal. Tameika’s program will change your life, teaching you how to eat the food you love, in moderation and challenge yourself to enjoy the food but don’t let it over power you. During her four week program she teaches you the slow and steady lifestyle process with food and exercise. Two things I remember her telling me when my body was stalling is “Kerri I’m not worried about you, you will hit your goal and Kerri don’t be afraid to eat especially the carbs”. I hit all my goals with the 4 week program, losing over 11 pounds and toning my body. But wait the best part is, based on my number 1 goal which is maintaining, I’m currently 3-4 weeks post one on one with Tameika and I’m down another 5 pounds. The slow and steady program she offers really works and once you put your mind to it, you’ll definitely see results. "My time with Tameika was great. I found her via social media and had always had a hard time tackling my food. Fitness was not an issue for me so I opted in for the nutrition side of things with Tameika. Getting a grasp on accountability, and not binge eating was where I needed to change and Tameika coached me along the way and gave the the tools and resources I needed to be able to control my diet in a balanced realistic way. We continued for almost 4 months, and I will continue to take a month here and there with her on her accountability program to make sure I always hold myself accountable. I lost inches, body fat percentage and gained a better understanding of myself and my relationship with food. Thank you for all you have done for me, and anyone who works with Tameika is lucky to have her guidance and positive light"
"If it wasn't for this plan and Tameika, I don't know if I would have ever taken the steps to become more active." “I think if I could describe in one word what it was like working with Tameika, I would have to say REVITALIZING. Working with her has brought hope back into my weight loss journey and I will always be thankful for that. She has gone through all the struggles we all have with loosing weight and it refreshing to talk to someone who has been there. The accountability she provided to me was that woke up me! This women genuinely just wanted me to win and I didn’t want to let her down. It than turned to me not wanting to let myself down. Even though I am only at the beginning of my journey Tameika has given me the tools and confidence to keep going! So if you’re thinking of working with her just go for it! “I am so happy I decided to change my life and email Tameika." "She tailored everything from my meal plan to my exercise routine in order to suit my individual schedule and goals." Start a better you today!